^^^ Sunshine at the start. 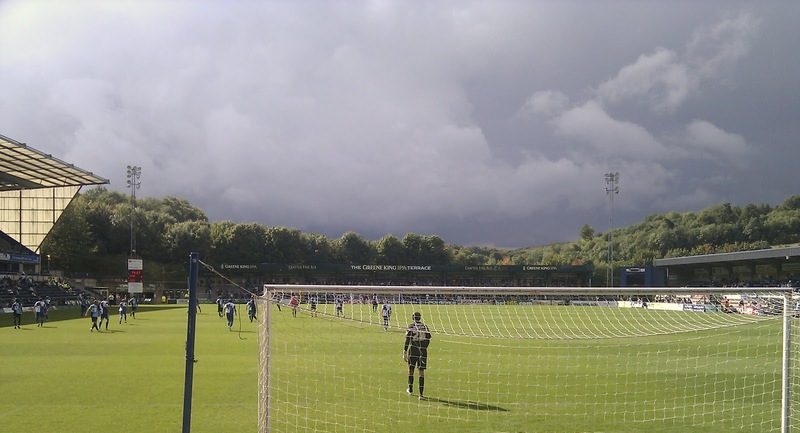 But, "there may be trouble ahead ... "
It dawned on me, in the run-up to this game, that Adams Park must be one of my most frequently-visited Football League grounds. 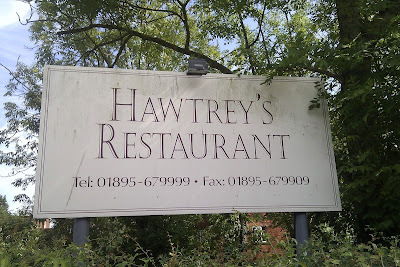 Possibly behind only the Memorial Stadium, Bristol, and Stamford Bridge. Unsurprising, I suppose, bearing in mind it's proximity to Maidenhead. I first remember going there with the entire immediate family for a (dreadful) Boxing Day game in the mid-90s. My Dad remarked last Saturday, when discussing this on the walk to the ground from the parked car, that he thought Walsall were the opposition on that occasion. Subsequent research on Soccerbase indicates that the Saddlers, featuring ex-Chelsea striker Kevin Wilson, won 2-0. It was the 1996/97 season and W@nky had beaten Rovers at the Mem the previous Saturday ... by the odd goal in seven! Many of my visits to Adams Park have been to watch the Magpies, usually in Berks & Bucks Cup finals. Most memorably in 1998 when a strong Reading side, containing Neville Roach, was beaten 2-1; our first County Cup success in 28 years. Roach had opened the scoring before Vernon Pratt equalised and knelt before the away fans in celebration. This image was on the cover of the following season's programme. If you look closely, you can see me in the top right-hand corner ... although my face is out of shot! The win was famously sealed by a 30-yard (plus?) screamer from Brian Connor, top corner from the moment it left his boot. This would immediately prompt a mini pitch invasion and, later on, the iconic "Royals rocked by Connor strike" headline in the local paper, a copy of which hung proudly in Stripes until Mark Steward - or some other ignoramus - took it down, most likely in a vain attempt to make the clubhouse more appealing to fat fighters, mother support groups and the like. ^^^ See that headless bloke, very top right-hand corner, in the light-coloured jacket? That's me! Honest. 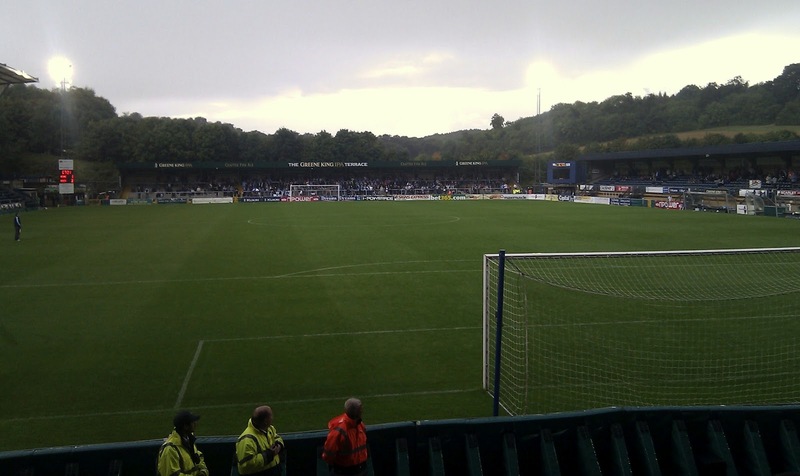 The 2001/02 final saw another success for the Magpies at Adams Park, this time over Chesham United. Macleod (P) and I were prevented by the stewards from putting the flag up for 'elf n safety' reasons (more on that later) before Macleod (M), Macleod (C), Craig, Willie and others belatedly turned up in the second half, having literally just arrived back from a trip to Barcelona. 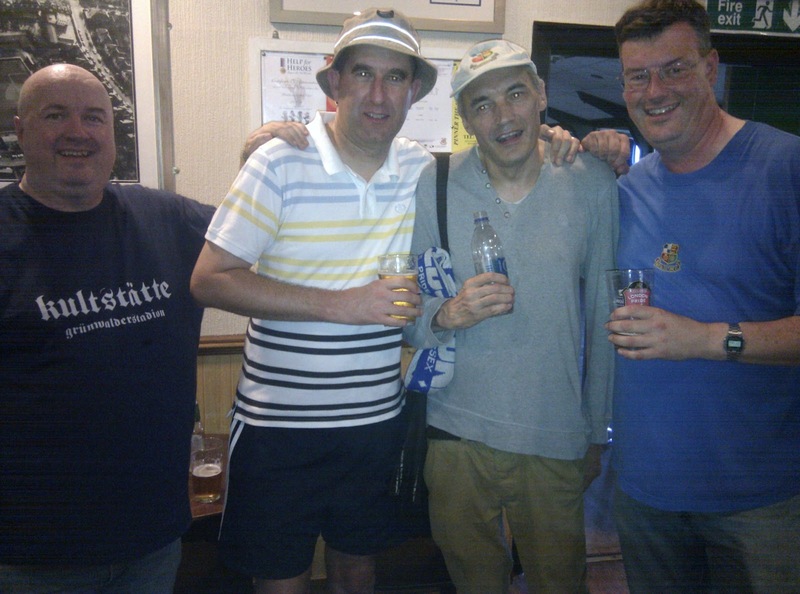 They were all wearing sombreros and would help cheer us on to a 4-2 penalty shoot-out win, after a goal-less draw. I'm not certain, but I think MUFC Hall of Famer Tim Cook - having recently fallen out with Alan Devonshire - might've missed a penalty for Chesham. Good lad! I actually like Adams Park, the ground, but it's industrial estate location leaves much to be desired. Indeed, a pre-match thread on the Rovers Alternative Forum suggested this was among the worst away days in the entire Football League. Hard to argue. Pessimism abounds on that particular forum, though, albeit perhaps with good reason; Rovers' summer preparations hadn't gone smoothly, with pre-season expectations dampened by the departure of talented but temperamental winger Mustapha Carayol, on/off transfer sagas (involving an Oxford United striker and Faroe Islands defender), plus the seemingly-annual goalkeeping crisis (hopefully resolved by the loan signing of Sam Walker, protégé of recently-appointed part-time goalkeeping coach Dave Beasant). 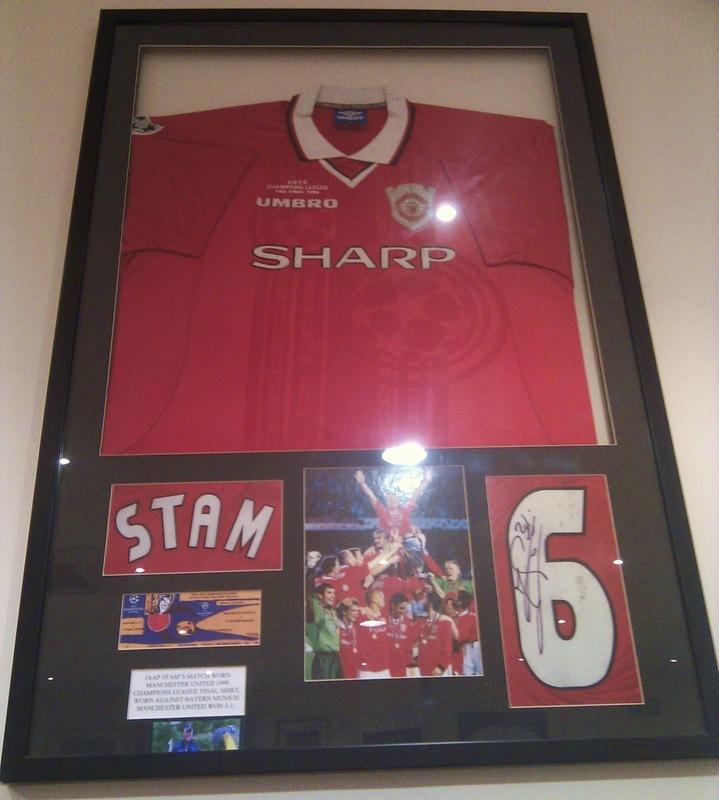 ^^^ A signed Caymanchester United shirt on the wall of a League Two clubhouse in Buckinghamshire? Noddy. After a reasonably-priced pint (£2.80) in the small but smart clubhouse (with the bar now at the opposite end of the room, compared to my last visit) and paying £40 combined for one Adult and one OAP ticket (eventually; the ticket office operators were slower than a turning Pat Baldwin/Pat Sappleton) we took our seats in a three quarters or so-full away end, behind the goal where Pratt and Connor had scored some 14 years previous. My Dad would comment on one of the more 'interesting' tattoos on display, and also remark that Rovers' rotund centre half Adam Virgo - who would go on to make a couple of decent blocks - "looks like a Sunday League player". Rovers dominated the initial proceedings and deservedly lead when Dave Clarkson (a goalscorer for Scotland against the Czech Republic in 2008 ... as witnessed by Craig) drove down the left and Lee Brown neatly finished the cut-back. The away side were passing it around nicely, with Wayne Brown and Matt Gill patrolling the midfield, and new signing Tom Parkes looking assured at the back. W@nky equalised, however, when Parkes and full-back Jim Paterson combined to leave former Exeter City lump striker Richard Logan free, to head home at the far post. Diminutive ex-Didcot Town and Weymouth striker Stuart Beavon had a hand in the equaliser and he looked lively as W@nky came back into the match with the scores once again level. Rovers would regain the lead around the half hour mark, however, with a strike as good as Connor's back in '98. Target man Matt Harrold - who held the ball up effectively throughout the afternoon, against one of his former clubs - caused confusion in the W@nky defence and, as the ball broke, recent Wales U21 international call-up Eliot Richards took a touch before leathering the ball into the net from fully 30 yards. A truly great goal. Richards would soon score again, to put Rovers two up, with another almost as good; a first-time effort from inside the box after a poor defensive header. Word on the street (or, more accurately, the forums) is that Richards might enjoy the off-field trappings of being a professional footballer a little too much. If he applies himself properly, then League Two (and above) had better watch out. Rovers were again in complete control at this stage and, as the half-time whistle sounded in glorious sunshine, I looked forward to them possibly extending their lead. Regardless, three well-deserved points were surely in the bag. I really should have known better, though ... this is Bristol Rovers after all! With the players back out and lined up, the referee - Andy Davies, your name shall go on the list - prepared to signal the start of the second half. The skies had darkened rapidly and the heavens opened. The rain poured down noisily and the scene was almost apocalyptic. The referee hesitated, for what seemed like ages but probably wasn't more than a minute. He eventually decided to continue. A mistake, in hindsight. If he had taken the players off at this point, I could have understood it. Instead he played on, as the rain got heavier and the conditions increasingly problematic for the players; the ball was still rolling OK (ish), but they were sliding about (Clarkson falling over when it would have been easier to score). As lightning forked in the sky, rain lashed down and into the stands; fans clambering back from the exposed front rows. After one particularly loud clap of thunder (the last? ), the referee spoke to someone on the touchline and then took the players off. 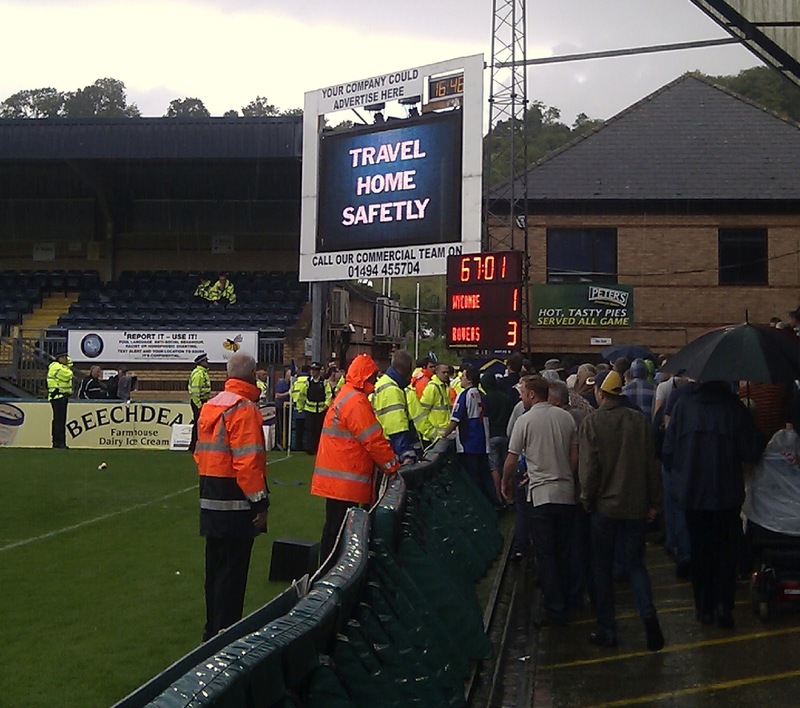 The electronic scoreboard showed 67 mins. Ironically, it had started to brighten and the rain almost immediately subsided (there would be no more thunder and/or lightning). The tannoy announcer declared that the match WASN'T abandoned and instead the referee was going to take time to 'assess' the conditions. W@nky sent out a member (just one) of the ground-staff with a garden fork - to much laughter from the away end - while Rovers sent out their subs to knock the ball about. Then, after about 20 mins or so - and with the referee not once having emerged to 'assess' the conditions - Mark McGhee signalled to the Rovers support that the game was off. Cue a loud chorus of boos and chants of "We want our money back" from the away end as the W@nky fans - complete with drum (quelle surprise) - celebrated. 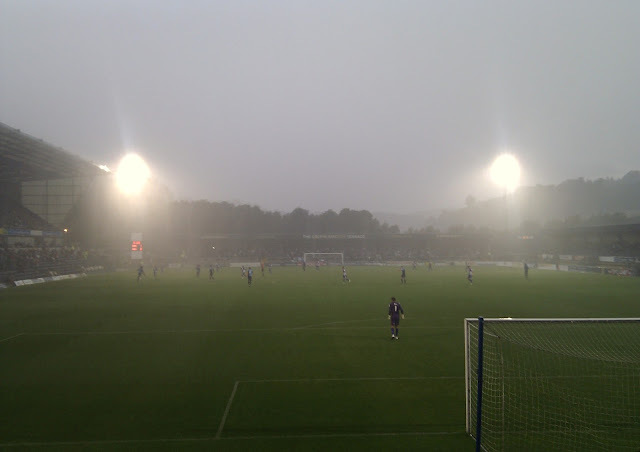 ^^^ Instead, the match was officially abandoned at this point! W@nky. "Flooding in and around the Adams Park stadium and a bolt of lightning which struck the Dreams Stand - where the Bristol Rovers fans were housed – left no other option but to cancel proceedings". So the referee abandoned the match on the advice of the ground's 'elf n safety' officer (who is, presumably, a W@nky Wanderers employee)? I imagine Davies would (now) say that he had to stop, initially, because of the lightning and then couldn't re-start - after the lightning had passed - because the incessant rainfall had subsequently made the pitch unplayable. I very much doubt, though, that the same decision would have been reached if the home side had been 3-1 up. There were plenty of thunderstorms and heavy rain across the country on Saturday, but how many League games started and failed to finish? Just the one. Rovers certainly have many positives to take from their performance but it is difficult to focus on that, in all honesty, at the moment. 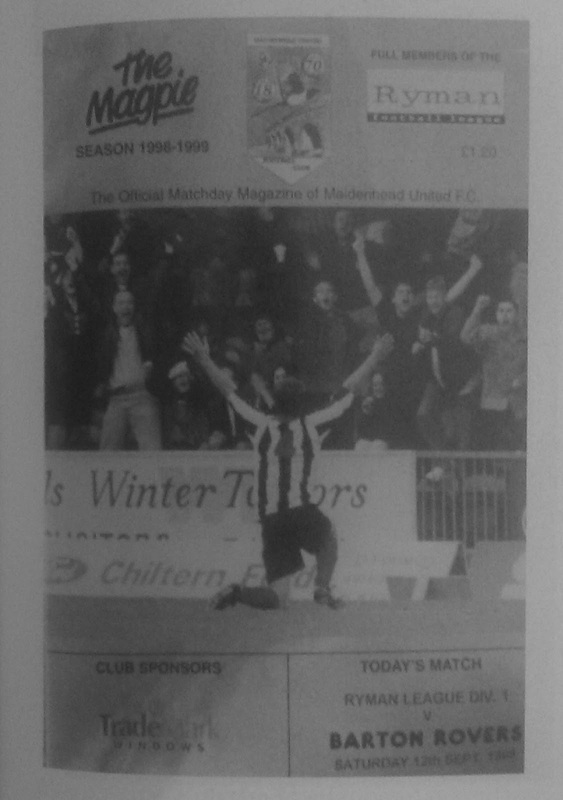 As a Maidenhead United fan, my dislike of W@nky Wanderers (a term coined after their then-manager Martin O'Neill made some disparaging remarks about the Magpies when linked with the Nottingham Forest job in the early 90s) was already deep-seated. I now dislike them even more (if that were possible). As such, I'll feel exceedingly sore when they win the re-arranged game. Which they will. W@nkers. ^^^ "Travel home safetly" (sic). W@nky all over. PS. Back to my place, after the game, to watch Chelsea vs Newcatle on ESPN and enjoy a fine chicken curry, lovingly made by the wife. We then all watched 'Indiana Jones and the Kingdom of the Crystal Skull' (as my Dad loves Indiana Jones, almost as much as he does Chelsea!). My verdict (on the film, as I don't give a #### about Chelsea)? Well, clearly the 'Last Crusade' should have been exactly that. 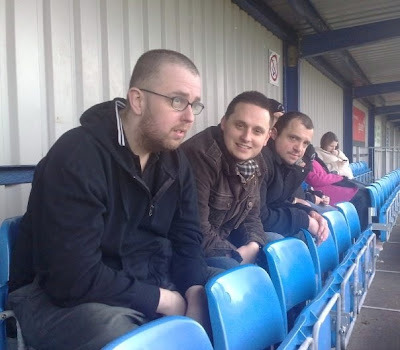 The second Stones home game of 2012 for me and Macleod (M), but Craig's first ever visit to the 'Land of Scaffold Poles'. 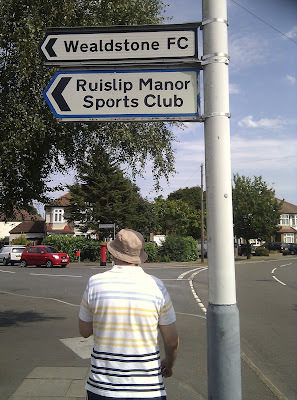 Craig was actually the catalyst for our attendance; running the rule over the excellent facilities at the Ruislip Manor Sports & Social Club ahead of the Tartan Army's visit to Wembley next summer. The bright sunshine and sweltering heat accounted for Macleod (M) wearing a floppy hat à la Liam Gallagher Roberto Mancini. I was in flip-flops. 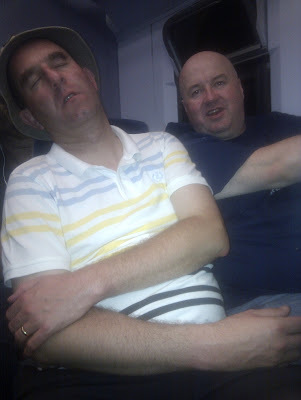 Gallagher (L) Mancini (R) Macleod (M) wanted to watch the Dirty Leeds game and so we went to Ruslip tube station, as opposed to Ruislip Manor, primarily in the hope of finding a pub showing El Hadji Diouf et al in action. 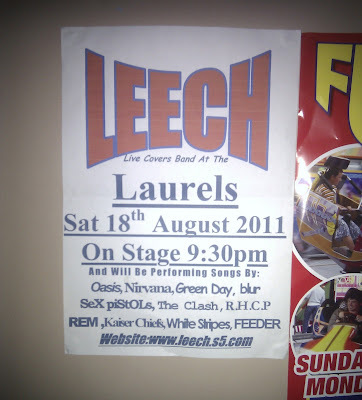 We did find one: an Irish place called the Laurels which, judging by the huge array of CCTV cameras, is probably quite 'lively' come nightfall. At one stage a riot van parked up outside. We wondered whether this might be the Met Police team bus! I assumed that the Laurels were immensely proud of having hosted Leech, and so had kept the promotional poster up ... Macleod (M) pointed out it was more likely that someone had instead put down the wrong date (year). Oh yeah! 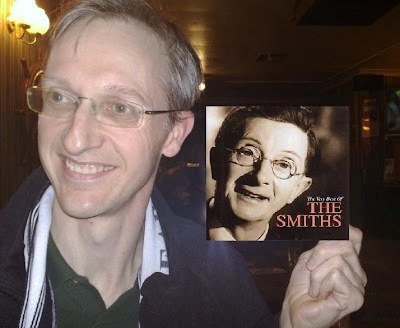 Charles Hawtrey Logic had actually been mentioned earlier in the day, as we briefly discussed his beloved Ross County's match-up with Celtic. Indeed 'Scottish football' cropped up on several occasions: (1) Rangers' record-breaking fixture with East Stirlingshire and (2) our planned excursions to see the Shire at Ibrox in March and then at Elgin City. The Elgin match is in May, the final league game. Typical of us to be busy organising a trip for the last day of the season, on the first day of the season! We arrived at the ground just after kick-off (beating Grim, who had been delayed due to 'leaves on the line' or something). Further pints were supped as we basked (or, more accurately, baked) in the sun, sat on the benches close to the turnstiles. Richard Jolly (who else?) had given Wealdstone the lead and Macleod (M) had collected on a scratchcard (with Rangers, picked on my insistence; he was going to choose Northampton!) by the time we ventured inside the ground. Macleod (M) and I considered going behind the goal the visitors were attacking and rousing the team (what is the point of them, BTW?) 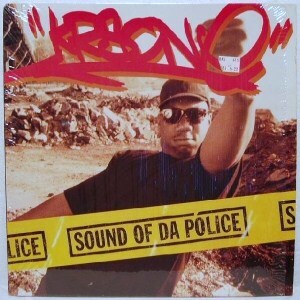 with a chorus of KRS-One, as and when they got a corner, but we decided against. Too hot. The weather probably explains why the on-field play and off-field atmosphere both seemed somewhat flat. A bit 'pre-season', if you like. A decent attendance (415 - over a hundred more than were at York Road for MUFC Ltd vs Tonbridge Angels) but little or no sustained noise. As aforementioned, too hot. In summary: another boozy day. 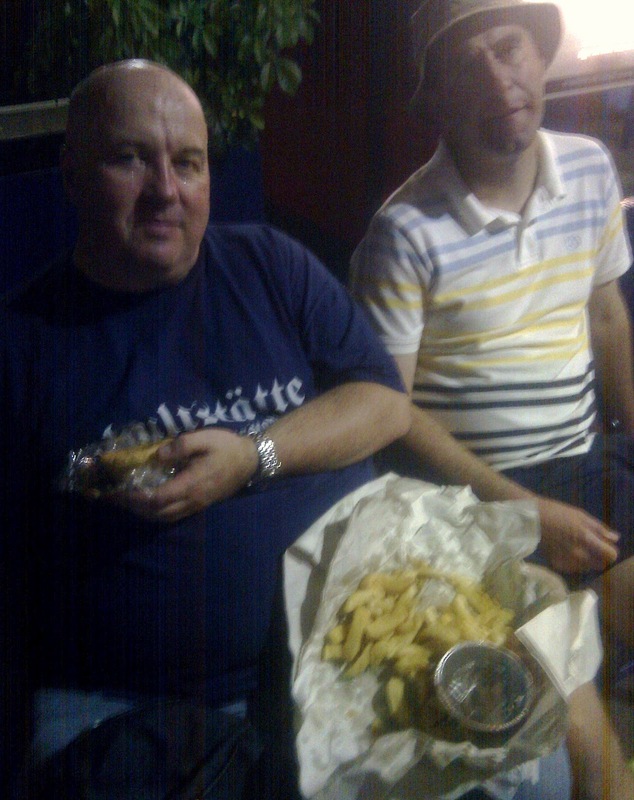 I think we'll have to leave it a while before our next WFC game as my liver won't be able take too many visits! Best of luck to them, though, as always. Fingers crossed, meanwhile, that MUFC Ltd get a decent FA Cup draw, otherwise Salisbury in November will likely be our first Magpies game of the season. Either way, I suspect shorts, sunglasses, floppy hats and flip-flops won't be required. Probably Definitely for the best! An interesting thread on the Conf South forum following Eastleigh's capture of Barnet's ever-present captain from last season (to go with Dale Binns, Moses Ademola and other obviously expensive summer signings). ^^^ Les, Macleod (C) and I during one of the dullest games of football I've ever had the misfortune to witness: a 0-0 draw at Eastleigh in February 2009 (we were stone cold sober, at this game, which didn't help!). 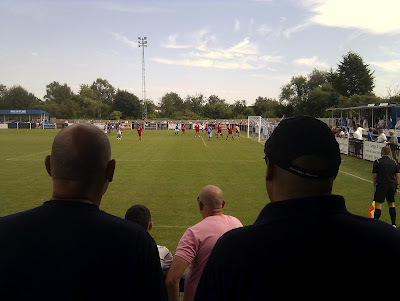 Seats added to 'behind-the-goal' standing areas at non-league football grounds? Great idea! Not.